Norita Kogaku K.K. was a Japanese lens and camera maker founded in 1951 by Norita Toshio. Norita Kogaku K.K. （ノリタ光学) was a Japanese lens and camera maker. It was founded in 1951 by Norita Toshio (車田利夫), a former employee of Tōkyō Kōgaku. The company worked as a subcontractor for other companies, starting with lenses for binoculars and moving via binocular prisms to pentaprisms for SLR cameras including the Rittreck 6×6 of Musashino. After some time, the company started making lenses too, notably supplying the Rittron lenses sold by Musashino for the Rittreck 6×6 and at least some of the Zenzanon lenses sold by Bronica. One of the lens designers was Maruyama Shūji (丸山修治), another former employee of Tōkyō Kōgaku, who previously worked on the postwar Simlar 5cm f/0.7. In 1969, the Musashino company went bankrupt, and Norita took over the machine tools and some of the staff from production of the Rittreck 6×6, which was modified and rebadged Norita 66. The new camera was produced for export from 1971, and released on the Japanese market in 1972. 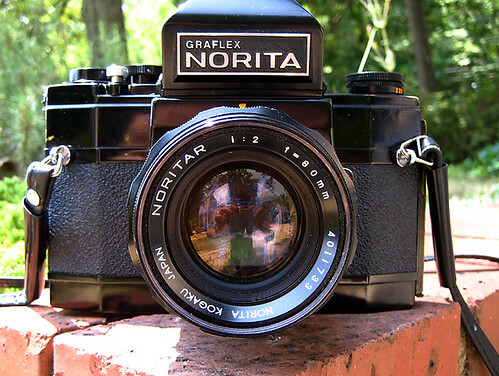 The company entered distribution agreements with Graflex (a division of Singer), which sold the camera in the United States as the Graflex Norita. In 1976, the company stopped the production of cameras and camera-related products, but remained in business, making projection lenses and other products. In 1994 Hagiya Takeshi wrote that the Norita products his readers were most likely to encounter were the three (RGB) lenses for large television projectors. Norita became a dependent company of Enplas in 2000 and was renamed Enplas Optics (エンプラスオプティクス) in 2001, but shut its doors in 2005. Product Lines: Photographic lenses, prisms, projection lenses for screen TV system, optical components. Norita Kogaku applied for a US trademark on the brand name Noritar on 25 February 1970. The application states that the Noritar brand was first used on 13 January, 1967. The trademark expired on 4 November, 1992. The company filed a US trademark application for the brand name Norita on 27 July, 1970, stating that the mark was also registered as a Japanese trademark (#568516). The trademark expired on 3 May, 2003. A Canadian trademark for Norita was filed on 23 April, 1970. The Canadian trademark was renewed on 20 August, 1986 and expired on 20 January, 1995. ↑ 1.0 1.1 1.2 1.3 1.4 Hagiya, p.82. ↑ 2.0 2.1 2.2 Norita Kōgaku in the Japanese Wikipedia. ↑ 3.0 3.1 Norita Club page 2, at the Topcon Club. ↑ This page of the Topcon Club. ↑ Hagiya, pp.82 and 90. ↑ Hagiya, p.87, and Norita Club page 1, at the Topcon Club. ↑ 7.0 7.1 Hagiya, p.90. ↑ Camerart Photo Trade Directory, 1985, ISBN 9789995596378. ↑ Norita Club Page 1, at the Topcon Club. This page was last edited on 21 December 2017, at 06:26.